Here is a chart by month. I had seven losing months and five winnings months. My monthly average loss was -$119.12/month. It was a costly year in the beginning of 2007, but I managed a rebound towards mid year and ended with a total lost of $1429.44 January and February was a real bad month and costly learning experience. I played at the Detroit Casinos, and it was a hard lesson, but those players there are the best in the world. Here is a Cumulative Chart with each session in 2007 mapped out. In total, I played 124 sessions in 2007. 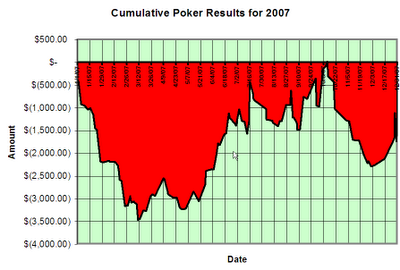 That is about 1 in 2.87 days playing poker or about 34% of the days in 2007 playing the game. My average loss per session is about $11.53 per session. As you can see I lost allot early on learning the game. I was stuck at close to $3500. I made a good come back and even was profitable for one day. 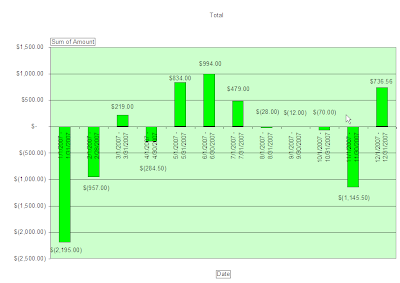 I only ended up with a total loss of $1429.44 for the year.